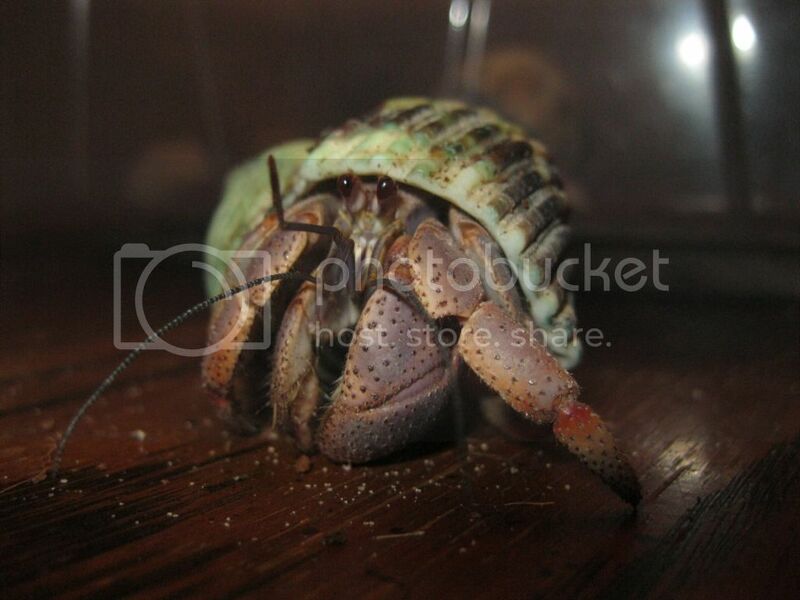 If you've been to even a single hermit crab site, you may be wondering, "What is this molting I keep hearing about?" Well, I will tell you. As a crab grows, it needs to shed it's skin, just as a snake or tarantula does. When a crab is ready to molt, it will take on extra water(especially salt water) and food. The extra water is to build up enough hydrostatic pressure, that they can actually split their exoskeleton, so they can get out of it. The extra food is to help tide them over during the molt, as after they lose their old exoskeleton (or exo), their limbs are very gooey and jelly-like as well as being essentially unmovable, so searching for food is right out. During their molt, they are EXTREMELY vulnerable to predation from both regular predators (in the wild) and other crabs, so many people recommend isolating your crab if he is molting or about to. I will cover that part in a little while. If your crab is getting ready to molt, you may see him literally hanging out in the water dish for a couple of days at a time, eating and drinking excessively, or digging like crazy. He may also have a cloudy look to his eyes and an ashy cast to his coloring. He may be very lethargic. Sometimes you will have no other sign than him burying and not coming back up for a couple of weeks or longer! When a crab needs to molt, they actually have a hormone that tells them it's time, and if conditions aren't favorable, they can actually suppress that hormone. If they delay too long, they may end up doing what is known as a "surface molt" which is exactly what it sounds like-he molts above ground instead of below. This is not the safest thing for a crab, but it doesn't necessarily mean anything is wrong. It could happen to a crab you have just gotten from a pet store he's been at for a while or it could mean your crabitat conditions need adjusting. They usually need darkness as it helps stimulate the hormones that signal the beginning of the molt. When your crab goes down to molt (assuming he does), he may take a break for a day or two, or begin right away. Either way, he will have a little pocket of air (sometimes with what I call a "chimney hole" to the surface) below the substrate where he will have his molt. He will break his exo open and get out of it. Again, he may take another break. Eventually, he will begin to eat the pieces of his old exo in order to recycle the nutrients he needs to grow his new one. Calcium is also an important nutrient during this time, so if possible, provide him with something like cuttlebone, crushed oyster shell or eggs shells to help. He may take another break, after all, growing new skin takes work! They have a little bubble under their abdomen of stored water that they take down with them, but will still need some water in with them (if they are isolated). When their new exo starts growing back and hardening, they will eventually come back out and rejoin the group. NEVER DIG UP A MOLTING CRAB IF IT CAN BE AVOIDED!! Molting is a very trying time for them and as I said, their limbs are all yucky and they can't move to defend themselves. I have even heard of a molting crab falling right out of their shells! You can prepare an isolation tank for your molters as some prefer, or you can isolate your molter in-tank. An ISO tank wouldn't need to be very big, but it would need to have the same conditions as your regular tank, as far as humidity, temp and substrate, but without all the toys-they are in there for work and wouldn't use them. They would need some calcium sources (sources of chitin-often the same foods) and some water. An ISO tank stays fairly clean (except for left over exo pieces) because they don't really poop when they are molting, as they recycle the nutrients from the old exo. I have thus far had to isolate my molters with the in-tank method as I got surprised and had no ISO tank. The in-tank method is I think easier (on both you and the crab) and less stressful to the crab. This method involves nothing really more complicated than the top to a 2 liter bottle and (this is what I used) a small plastic medicine cup. The 2 liter part I got from other sites, the medicine cup was my own improvisation. 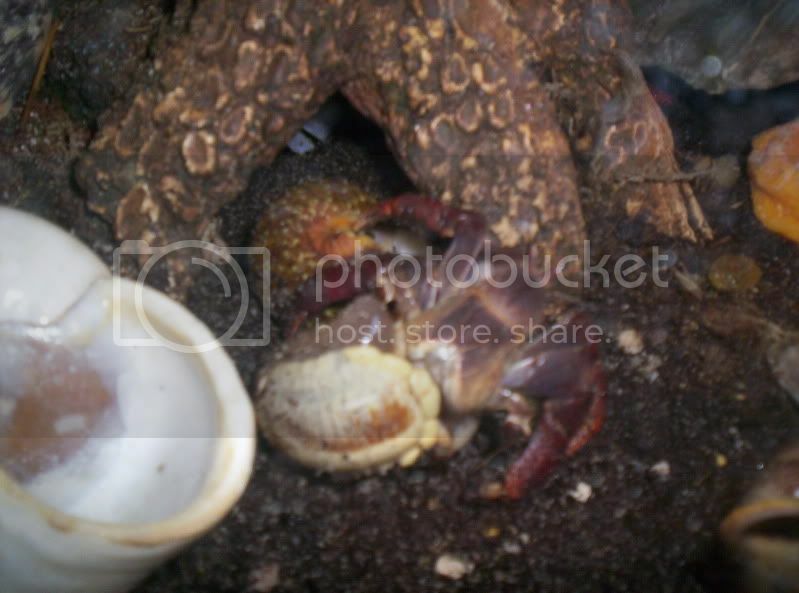 When I discovered my molter (ButterCup) RIGHT after she molted (she was gooey and her old exo fell out of her shell when I lifted her), I washed out a little medicine cup (with de-chlorinated water) and put a little bit of lightly salty water in it, some egg shells and covered her up. The way I did that was I washed out and dried the cut-off top to a 2 liter bottle, took off the lid (which you can save for the water dish if you have a smaller molter) and pushed it down in the substrate around her; creating what I came to call.....The Iso-Sphere (I know, not totally a sphere, but it reminded me of Arizona's "Biosphere" of a few years back ). YOU HAVE TO BE SURE THE PLASTIC GOES ALL THE WAY TO THE BOTTOM OF THE CRABITAT, or the other crabs will try to get at her, as the smell is irresistible to them (probably the instinct that gets them to eat it after molting). While crabs normally don't seem to get the concept of going around something , they will burrow under or crawl over ANYTHING; including other crabs. You can not use any other kind of divider to separate them in the tank, or the others will get at it-they are crafty! Sue pointed me to this link about molting! Wow, to be able to get a picture like that is amazing! thank you so so much! In the middlew of a molt and i have now stopped freaking out!! Thank you! Thats a good picture to show that.